Are feeder series systems, as we know them, becoming obsolete, perhaps even redundant? Big words coming from the best Formula One driver of all time. -I said best, not most titles- But as we all know the one with the most titles also started out in karts. 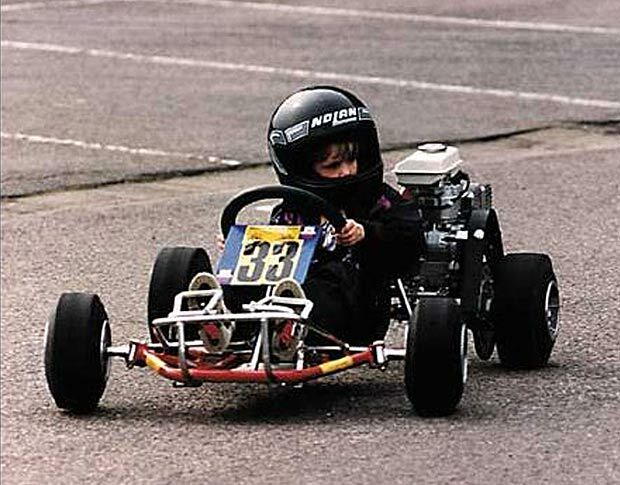 -For those of you living in Germany, the Netherlands or Belgium, you might have been to the Schumacher kart centre in Kerpen- Both guys started around the age of 4 and built a firm foundation of the race-class they’d later show the world. It is said that their rain driving, which was pure magic, was because of the feel karts have in the wet, which is virtually no grip. The racing on those levels is pure and I can’t think of any other series which could be better to start in… I don’t think there is anything wrong with karting nor do I think there’s anything wrong with the various F4 and F3 series. All the ‘greats’, ‘wanna be greats’ and ‘soon to be greats’ proved their worth in some of those series. Of course I’m not only talking about Formula One drivers, the lists of champions in lower formulas is endless, with some of them never reaching F1 or perhaps only testing. Nevertheless it’s not that some of them can’t build a massive racing career in other classes. Oliver Gavin is the name that first comes to mind. British F3 champion in the 90’s, test driver for the Pacific Grand Prix team which went belly up somewhat later, and a test drive with the McLaren F1 team, which didn’t like that he was so tall. After that he even drove the safety car for a couple of years, in between testing for Benetton and Renault. And finally ending his Formula One career without a proper drive. But for me he is one of the greatest GT drivers I ever witnessed live and on tv. He went on to win the Le Mans 24 hours, in his class, five times. Same goes for the 12 hours of Sebring, Petit Le Mans race at Road Atalanta and the American Le Mans series. All five times, in those glorious corvettes. He is a master in using the surrounding (faster) traffic of prototypes to his benefit. That he never got a proper drive in F1 is ultimately F1’s loss. Anyway back to the feeder series. 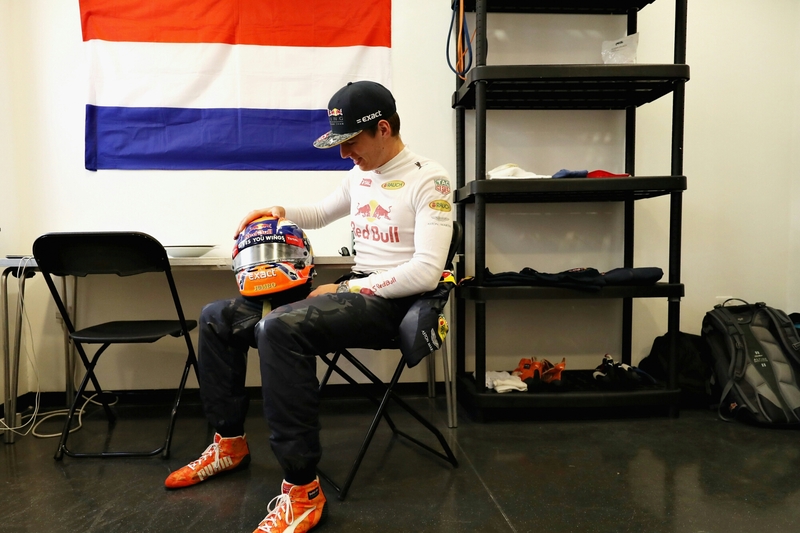 Since Max Verstappen jumped in to F1 straight from F3, -something which Senna also did by the way, only difference being that Senna had the opportunity of testing Formula One cars, something that is forbidden nowadays except for that one mid-season test session of two days when the FIA threw the teams a bone, if they’d give youngsters a chance to do it. Actually now that I think about it, it wasn’t only Senna who did this before Max, there was also Nigel Mansell who did the same F3 to F1 jump, and one Mika Häkkinen. If I recall correctly that’s six world champion titles. I started questioning the whole feeder concept. And it seems to me the FIA felt the same because they’ve announced a big turn around in how they’re going to get the kids ready. But I feel a big part of it was the age of young Max, and the storm of protest it generated. That’s an other slight difference between him and Senna. Senna was 24 when he drove his first Formula One car in an official grand prix. But times change, as I am fairly certain a 16 or 17 year old would not have been able to drive a car back in those days, and by that I mean purely physically. Anyhow, Max showed us that now it is possible and the FIA wants to show us that they’re against it. So what they are doing is planning the ‘FIA Global Pathway’. A trajectory from karting all the way to F1, through which young drivers earn points in order to get their super licence while going from series to series with increasing power levels. The first step after karting is Formula Four, for drivers aged 15 and older. The Formula Four class consists of different championships, all using the same chassis and the same, by the FIA homologated, 4-cylinder engine which is, in my opinion, the best solution at that level. It keeps the class fairly reasonable in price and levels the playing field. Drivers are permitted to partake in multiple championships and because the cars (and the tires) are all the same there is little adjustment needed, but they do get to know more tracks. Once they’re ready to progress there is a chance of advancing to Formula Three. Here they are allowed to use different engines as long as they are 2-litre, 4-cylinder, 200 bhp stock engines without any private tuning. This might be the first time they experience differences, not only between their own talents but also between the vehicles at their disposal. The F3 championships also have a greater diversity of tracks but the drivers can opt to do fewer championships at the same time. 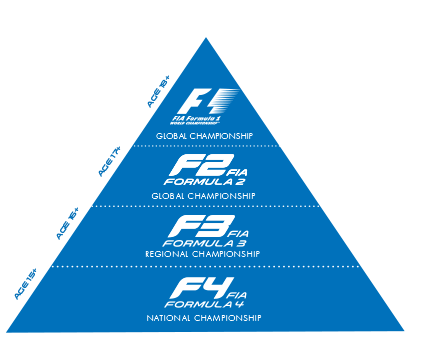 Of course, F3 is more expensive than F4, but they will now learn the real differences in motor-racing, and experience a pretty steep learning curve. It is here that fans can witness first-timers driving in an ‘Alonso-esque’ manner. Where driver talent transcends the qualities of the car. From F3 progression was via Renault 3.5L V8 or GP2. The FIA wants to rebuild Formula 2 as a substitute for the Gp2 class but since this was to begin in 2016 I’d say it missed the start already. The proposal was to have 10 teams, each with two cars, in 10 or 12 race-events, each consisting of two races. The races would be held on, at least, two continents supporting either FIA world championship events or as standalone weekends. -In my opinion the supporting formula works best to provide more recognition. The FIA wants a car nearly as powerful as the Gp2 cars but as strong as the 3.5L V8. While the Renault cars only had around 530 bhp, GP2 has 612 bhp for cars weighing 688kg. F2 cars will have 600bhp and 670kg . Furthermore the FIA wants technology which comes close to Formula One, such as DRS (oh no! ), carbon brakes, hybrid technology and tires and rims with the same specifications as F1 during the same year. • You must have a minimum age of 18. • You must hold an FIA International Grade A licence. • You must hold a current road driving license. • You need to have, at least, 2 years experience in the junior single seater categories approved by the FIA. • In those years you must have been able to score 40 points on the FIA grading system. • You must have completed at least 300km of testing in a recent Formula One car. • World Endurance Championship (WEC) But only if you drive an LMP1 car. • European Formula 3 championship. • Formula 2 championship. Which still doesn’t exists. Of course the FIA wouldn’t be the FIA if they hadn’t thought of something to make a good idea go bad. Because it is a good idea, but the execution is rather poor. First of all, why only LMP1? The top of the endurance racing can use youngsters but the top of open single seater can’t? It makes no sense! What reason would they (the FIA) have to not include LMP2? Or GT cars? 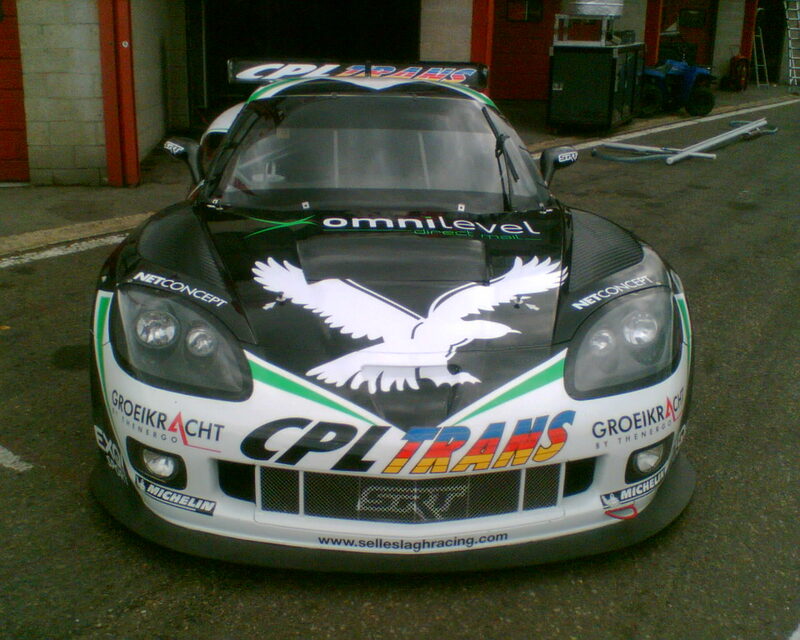 Remember that Grosjean, after being forced out of F1, drove in the (now deceased) GT1 championship. And rather well, I may add. Second of all, I could make the same point about Indycar and Indy lights. What reason may the FIA possibly have to exclude those championships? It is beyond me. And what’s even more embarrassing for the FIA (it’s like being embarrassed is their hobby) is that their non existent F2 championship is worth the most points! But in my opinion Gp2 is everything that is wrong with the whole feeder series concept. It’s the final step before F1, but is it a good one? It’s been a series where drivers often became champion after three or four seasons, which hardly says ‘wow, look at that super talent’. Only exceptions being Nico Hülkenberg, who was much better than his team mate (64 points better) but also dominated the whole field (25 points ahead). And] Stoffel Vandoorne, destroyed the field in a way never seen before in that class, scoring 108(!) points more than his nearest rival and 273 (!!) more than his team mate. Of course many of the GP2 champions and runners-up made it to F1, and that probably is the main goal, but for 11 champions and 11 runners-up, and a total of 30 drivers who graduated to F1, only two have been champion in Formula 1. So two from thirty. Of course I know seats in the top teams are rare, even the ‘bad’ seats are hot, and demand is higher than supply. Hang in there, my point will become clear. Something which many (dare I say: most?) fans come to hate. Everybody has a right to that opinion but I think it’s a bit short sighted. Let me explain; over the past couple of weeks/months there has been a shitstorm towards Lance Stroll on various social media and Internet fora. People gunned him down because his dad drops some serious cashjiejs. Love it or hate it, his dad is allowed to do that. And the cold, hard truth is that Lawrence Stroll is able to bring his own money to the table. But my point is: every driver is a paydriver. Or was one. Think of it like this: what is the difference between a dad believing in his son or a sponsor believing in some random bloke? Whether you have money provided by a family member or you bring the backing of the biggest bank in Spain? Or if you’re in a young drivers program since your thirteenth birthday, which makes a big team pay all your expenses. Or, and this one is my favorite, when a whole government decides to give you financial support. I bet you’re all thinking at least two or three of these options are down to talent of the driver. That’s the difference! Well, guess again. Sure, your dad will always be a bigger fan of you than some cold, logical thinking, money addicted business man, so for the latter you have to prove you’re worth the investment. A task that is easier when you pack bundles of talent, I agree. But bear with me, sometimes both are combined. Remember how Jos tried it all to get Max in F1? Remember all the Dutch sponsors he got to give him a push in the back? And it’s not like Jos is just a poor boy from a poor family. (He’s not a poor boy from a poor family!) -(Actually I don’t know how much money his family had, but if you read that in your best Queen voice you’ll forgive me. )- Still, I haven’t heard anyone complain about the cash Max needed. But when an other dad is able to leave the sponsors out of it suddenly everyone is screaming bloody murder! Other examples you ask? Why certainly, what would a rant be without some good arguments and examples? If you think of the ‘greatest driver ever’ list, in F1, the top of those is made up by names we all know/love. If you’re older than 65 you’ll probably say the best ever was Juan Manual Fangio. 5 championships in one of the hardest, most difficult and lethal periods in the history of F1 will only back up your argument. But what if I told you that when Fangio wanted to come to Europe his car(s) and trip(s) were paid for by the Argentinian government. And throughout his career the government helped him, financially. This is making him a pay driver too. An other example, for the slightly younger of you? Let’s see… oh yes, how about if you’re a fan of Übermensch Niki Lauda? Well, Niki, in the days of his long passed youth, took out a couple of bank loans in order to get to where he wanted to be. I agree, it’s the most manly/insane way to be a pay driver, but hey, what did you expect of Niki? I’ve got a couple more examples but I want to bring math in to it. So let’s talk numbers, because numbers don’t lie! So 35 million dollars, for a full season in Formula One. In 2017 that is 20 races, with every race weekend having five sessions, three free practices, one qualifying session and one race. I think we can all agree that a race would have a bigger price tag than a free practice session. But I’ll divide it evenly, since he pays for the whole season. 20×5= 100. One hundred sessions for the price of $35,000,000. Breaking it down equally will be $350,000 per session. No hard maths so far. Pastor paid $473,684 per session in 2013. That’s $123,684 more for each and every session than Stroll, four years later. Remember numbers don’t lie. But it’s also, rather effectively, showing what is really wrong with the pay driver concept. I don’t mind if young, talented drivers need to bring funds to the table. It’s the way this sport works. It’s just the truth that Motorsport, perhaps the only sport in the world, is where talent and hard work alone aren’t enough. When it’s the money that keeps a not-even-mediocre driver in the game, for so long, it is clear that the system is broken. However, this is not the driver’s fault, nor the fault of those who want to spend money on said driver, be it Hugo Chávez or Juan Peron, if we think of government money, or Papa Stroll and his business dollars. To be honest I think the government money is worse, but who am I? But I’ve got some numbers to put it even more in perspective. You all remember one Michael Schumacher, some even call him the greatest ever. Well, there was a lot of money involved with him too. For those of you not familiar with the story I’ll summarise it. There was this wealthy German business man and Motorsport fan, who, once he realised that it wasn’t himself with the talents behind the steering wheel, decided to co-found a Formula 3 team. That man went by the name Willi Weber. And Willi was in need of a decent driver, like all team bosses. Drivers come and drivers go. But, as things work out sometimes, he stumbled upon this young lad called Michael Schumacher, who made an impression on Willi during a Formula Ford race. Now for the money part. If Weber hadn’t given(!) a chance to young Michael, we might (probably) have never heard of him. -It has been brought to my attention that this would be very debatable but I still feel I had to make this point, for the story’s sake.- Since the Schumachers weren’t a particularly wealthy family there was a fear that Michael wouldn’t be able to keep racing any longer. At least not on a level higher than Formula Ford. Of course, as we know him, he took full advantage of the situation and went on to win the championship for Weber’s team, in his second season. Weber, in turn, got in touch with a good friend of his, who was a big guy at that time at Mercedes. Young Michael became a junior Mercedes driver and made a, for many illogical, step towards endurance racing. That meant he’d be racing in the beautiful Sauber Mercedes C11. Like most endurance Sauber’s they were beautiful in my opinion, but that’s besides the point. Anyway fast forward to the point that my fellow country man Bertrand Gachot got in a bit of a dust up with a London taxi driver and decided he’d use some pepper spray. Which was an illegal weapon at the time. Don’t really know if that’s still the case but it doesn’t matter now. It was back then and that’s all that matters. 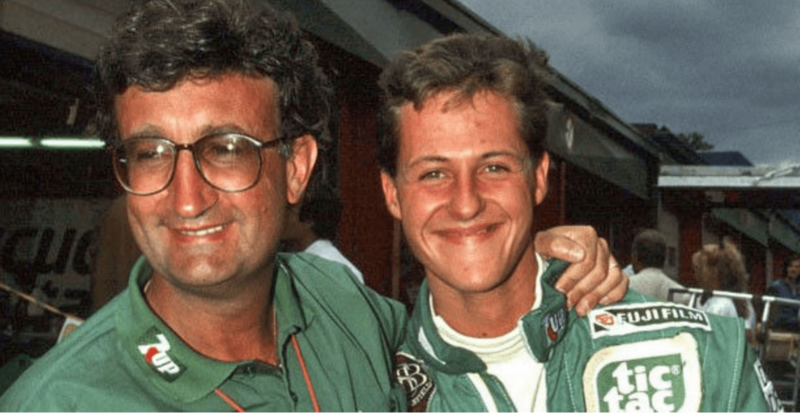 Gachot using it got him “some” jail time with the big outcome that our good friend Eddie Jordan was in need of a driver for his Formula One team. Like we discussed before, seats in the top class of racing are scarce and there are drivers enough on this planet. Only difference is that this happened eleven races in to the (F1) season. Which, naturally, means most (good) drivers are driving somewhere, somehow with something. 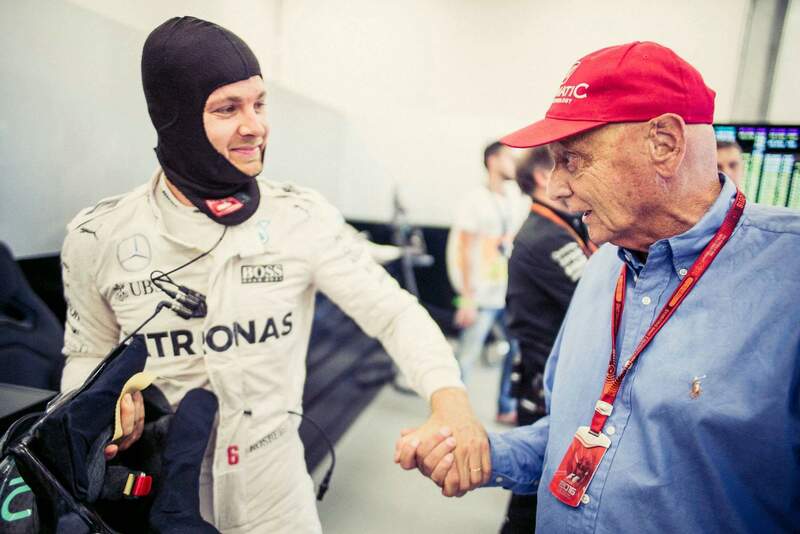 The story goes that Jordan’s first option was to lure Rosberg Sr. out of retirement. Five years after he raced his last F1 race. Ludicrous idea but you know how Eddie is. Anyway in comes ‘der Willi’ and his young protégé. After lying to Jordan about young Michael’s experience at Spa and the promise of a decent payment (of Mercedes’ money) and talks about Willi buying Eddie’s F3000 team, the deal was made for the young Schumi to test in the Jordan F1 car. Because, and this is a big point in this whole story, let us not forget that Jordan had a very small budget. Sure, the car was beautiful (one of the prettiest F1 cars ever) and it had sponsors on it. But no big paying sponsors. Here’s the difference between this story and Lance Stroll; Stroll’s dad pays for a seat in a world championship winning team. A team with a rich history and one which still has very good people on board. Jordan on the other hand, back in August of ’91, was a team comparable to the Marrusia/Manor and Caterham’s of this era. Low on cash, high on hopes. Only difference is that Jordan’s car turned out to be good enough to score a few points, occasionally. Thank you Gary Anderson. But still, the team had not enough allure for a big name to drive for them. 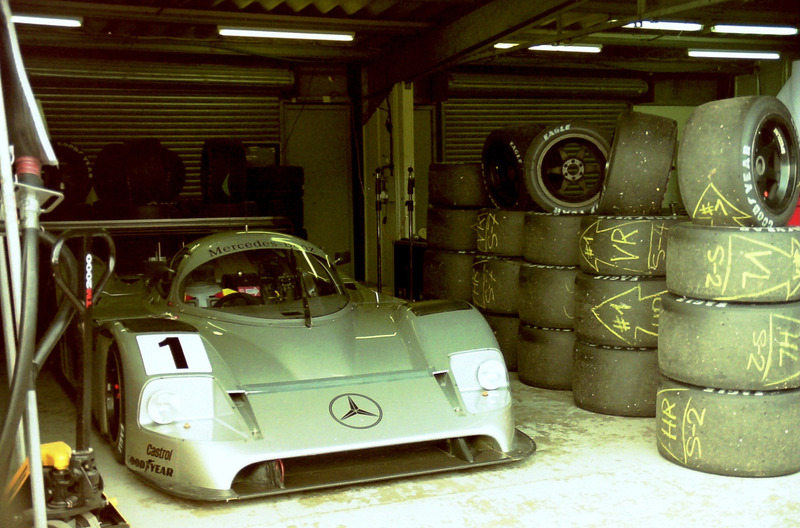 Mercedes willing to pay a good amount to let their boy test with the 191 was something Mr. Jordan couldn’t refuse. What Schumacher did at that test made Trevor Foster, Jordan’s team manager, beyond ecstatic. So all credit to him, once again seizing the opportunity. But it brings us to the next number. Because of the excellent results during testing talks soon went to racing in the Belgian GP. Schumacher’s sponsors Dekra and Tic-tac promised it would be worth £150,000 to them for Micheal to race and Mercedes guaranteed Jordan he’d get the money. Once again the inflation would make £150,000 back then $387,500 today. $387,500 to let an unknown driver drive one race, after one test session, with a team that struggled to be mediocre. And that’s saying it in a decent way, because let’s face it… It might have been one of the prettiest F1 cars ever, but that doesn’t mean the team was anything more than Sauber, Manor or Minardi at that time. So that gives a total of nearly $600,000, a lot of money, but yes I agree, not as much as Stroll’s $700,000. But still, keep in mind that Stroll pays for a multiple WDC winning team, who naturally should be allowed to ask more. And, let’s face it, Young Master Stroll has a better track record than Maldonado had. Maldonado is just an example of how money brings, and keeps, an unworthy driver in F1. Nothing more, nothing less. But he got a shot and yes he even won a GP. So wouldn’t it be fair to at least let young Lance have a try? Stay tuned, part two will follow tomorrow! Special thanks to Red Bull Media House for letting me use their Max Verstappen pictures. Jordan went to the Belgian GP in 1991 sitting 5th in the Constructors WC……..
I’ll fully comment when the second part is posted. But so far some of it is interesting some is wrong. that their car turned out to be better than what (small) teams produce these days is covered by that sentence!